Creamy & delicious. 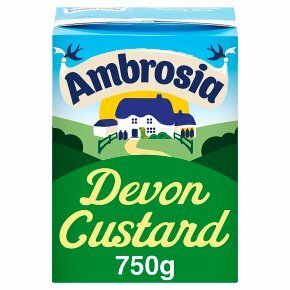 Made in our Ambrosia creamery, Devon. 100% natural flavours. A source of calcium. No preservatives. No artificial colours. Suitable for vegetarians. From our home to yours... "A day in Devon is a day well lived, and a passion for our home is poured into everything we do. From the first beads of morning dew glistening on the lush grass, the chattering streams running between the rolling hillsides, and the misty sunsets over the quiet farms, it's Ambrosia's home. At our Devon creamery, we let nature do the talking. It's what makes Ambrosia special. We put all our love into creating delicious puddings to satisfy your whole family"
Tastes delicious hot or cold...All microwave ovens vary, amend cooking times as needed. (800 watt/Cat E 3min):1. Empty contents into a suitable microwaveable container.2. Cover, heat on full power for 1 1/2 mins.3. Stir, re-cover, heat on full power for a further 1 1/2 mins. After heating please handle with care.